you wrote yesterday, make a copy of it, and give it to your loved one. Do not email him/her the Appreciation List, do not text it, do not post it on social media. Simply hand write or type a copy of the list you wrote yesterday and give it to your loved one. You can hand it directly to him/her, mail it, or leave the list somewhere he/she can find it and read it. Yesterday the focus was the creation of the Appreciation List along with studying and sowing that list deep into your heart. You have now had an opportunity to remember at least ten things that you appreciate about your loved one. Take today to remind your loved one what you appreciate about him/her by giving them a copy of your Appreciation List. Just as we have to remind ourselves we also have to remind our loved one what we appreciate about him/her. Life has a way of keeping us busy, but we must make time to notice and acknowledge the efforts of our loved one. I understand it’s easy to get settled into our routine, but do not let another day go by without reinforcing your love for your significant other. Your loved one wants to know that you’re thinking of him/her, that you care, and that you appreciate them. 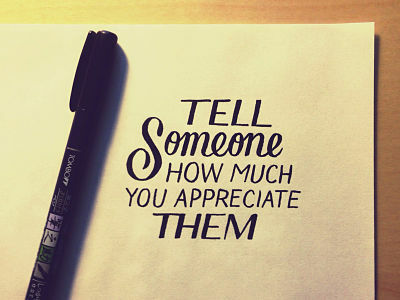 Please remember to show and express your appreciation with an open heart. Whatever you know your loved one’s needs are, that is what you should be doing to love him/her. Do not give anything to your loved one begrudgingly.